ALBUQUERQUE, N.M. — Today with 3D printing, you can make almost anything in a matter of hours. However, making sure that part works reliably takes weeks or even months. Sandia National Laboratories has designed and built a six-sided work cell, similar to a circular desk, with a commercial robot at its center that conducts high-throughput testing to quickly determine the performance and properties of the part. 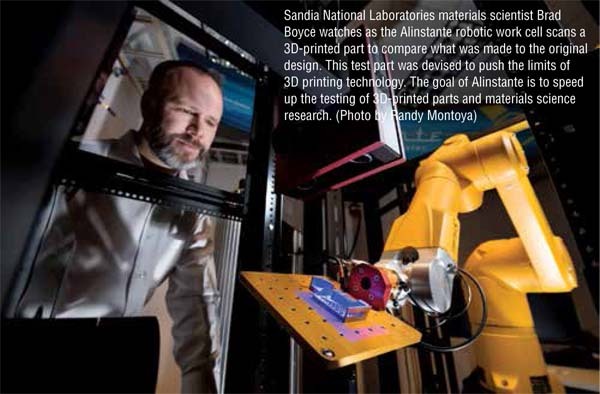 They call this flexible, modular, and scalable system Alinstante, Spanish for “in an instant.” Sandia is seeking industry partners to help expand or discover more uses for the new robotic testing system. The technology to speed up qualification and testing was the result of Sandia materials scientist Brad Boyce’s challenge in the spring of 2015. Boyce was working on a Laboratory Directed Research and Development-funded project to improve the qualification of custom 3D-printed parts. “In traditional manufacturing of metals, there’s a lot of experience and finesse in process control to produce metals with uniform properties. When we went to laser manufacturing, we had to take a step back and rethink qualification,” he said. Boyce had already developed a machine for high-throughput tensile testing — pulling on an object until it snaps — but for this project, he knew he needed a more general, flexible solution. He turned to Sandia’s robotics group. The commercial robot sits in the center of the hexagonal work cell with up to six “petal” work stations around it. Each work station can have a different commercial or custom testing system, and the work stations can be swapped in and out depending on the kind of tests needed. Also, because of the hexagonal shape, multiple petals can be combined in a honeycomb-like structure. That allows handoffs from petal to petal to provide almost limitless testing scalability. Sandia mechanical engineer Ross Burchard led the design of the work cell. In 2016, Burchard and an intern explored many different physical configurations before settling on the hexagonal petal design. “My challenge was: How do you come up with a work cell with one robot and multiple testing stations that’s also modular and scalable?” said Burchard. Once the configuration was selected, Burchard and his team built the first work cell. They adapted commercially available hardware wherever possible for efficiency and to save money. In addition to constructing the hexagonal floor plate and pedestal for the commercial robot, the team installed safety light curtains wherever a person and the robot might interact. The light curtains are set up so that if a person reaches into the work cell, or if the robotic arm reaches out of the work cell, the light beam is broken and the robot automatically stops. Blada hopes to have a user interface that will allow a non-expert to place their parts on a tray in the parts rack, select a few tests, and get their data automatically. The software architecture also needs to be modular so new modules and tests can be added easily, he said. The prototype Alinstante work cell only has two testing stations and a rack where users can place their parts. The first station is an off-the-shelf structured light scanner that can convert a scan into a 3D model for direct quantitative comparison to the original intended design. The second station is a load frame for testing physical properties, such as tensile and compression testing, which is pushing on an object until it crunches. Next, the team wants to add a laser-induced breakdown spectrometer to Alinstante, said Burchard. This test would be particularly useful for determining the batch-to-batch consistency in the chemical composition of parts in a minimally destructive manner. “Sandia has testing labs that can perform all of these tests; however, it takes a few weeks to schedule each of them, which can add up to one or two months of testing. 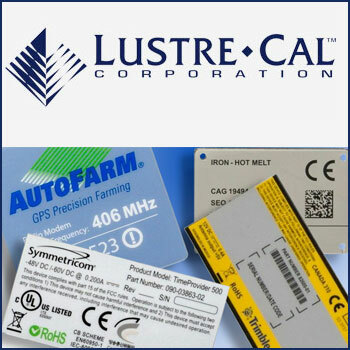 Alinstante can reduce the scheduling burden for the testing, greatly speeding up the turnaround time,” said Burchard. Alinstante also reduces the chance for human error and produces data that is more consistent and reproducible than human testers. X-ray tomography, corrosion testing, and density measurements are just a few examples of the tests the team would like to add to Alinstante. The Alinstante team is looking for partners to support the development of new modules that would meet its rapid testing, prototyping, or research and development needs, said Boyce and Blada. As a roboticist, Blada is looking forward to putting Alinstante’s endurance to the test. “In theory, you could run this thing forever, if you had enough parts,” he said. As a materials scientist, Boyce is looking forward to being able to use Alinstante for rapid materials discovery and for foundational advances in alloy performance and reliability. If you’re ever unlucky enough to have a car with metal tires, you might consider a set made from a new alloy engineered at Sandia National Laboratories. You could skid — not drive, skid — around the Earth’s equator 500 times before wearing out the tread. Sandia’s materials science team has engineered a platinum-gold alloy believed to be the most wear-resistant metal in the world. It’s 100 times more durable than high-strength steel, making it the first alloy, or combination of metals, in the same class as diamond and sapphire, nature’s most wear-resistant materials. Sandia’s team recently reported their findings in Advanced Materials. 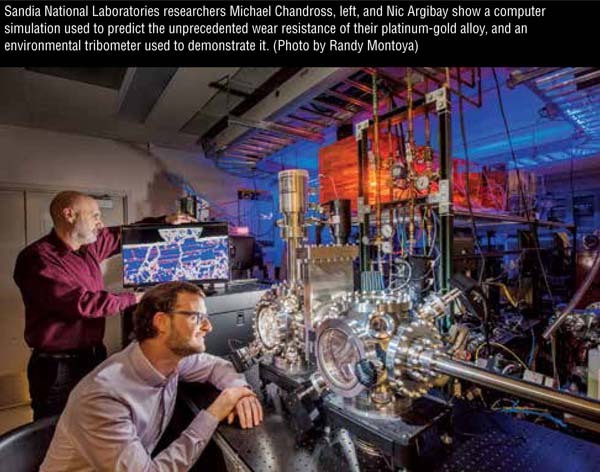 “We showed there’s a fundamental change you can make to some alloys that will impart this tremendous increase in performance over a broad range of real, practical metals,” said materials scientist Nic Argibay, an author on the paper. Although metals are typically thought of as strong, when they repeatedly rub against other metals, like in an engine, they wear down, deform, and corrode unless they have a protective barrier, like additives in motor oil. In electronics, moving metal-to-metal contacts receive similar protections with outer layers of gold or other precious metal alloys. But these coatings are expensive. And eventually, they wear out, too, as connections press and slide across each other day after day, year after year, sometimes millions, even billions of times. These effects are exacerbated the smaller the connections are, because the less material you start with, the less wear and tear a connection can endure before it no longer works. With Sandia’s platinum-gold coating, only a single layer of atoms would be lost after a mile of skidding on the hypothetical tires. The ultra-durable coating could save the electronics industry more than $100 million a year in materials alone, Argibay said, and make electronics of all sizes and across many industries more cost-effective, long-lasting, and dependable — from aerospace systems and wind turbines to microelectronics for cell phones and radar systems. You might be wondering how metallurgists for thousands of years somehow missed this. In truth, the combination of 90 percent platinum with 10 percent gold isn’t new at all. But the engineering is new. Argibay and co-author Michael Chandross masterminded the design and the new 21st century wisdom behind it. Conventional wisdom says a metal’s ability to withstand friction is based on how hard it is. The Sandia team proposed a new theory that says wear is related to how metals react to heat, not their hardness, and they handpicked metals, proportions, and a fabrication process that could prove their theory. Now they have proof that they can hold in their hands. The alloy looks and feels like ordinary platinum, silver-white and a little heavier than pure gold. Most important, it’s no harder than other platinum-gold alloys, but it’s much better at resisting heat and a hundred times more wear resistant. The team’s approach is a modern one that depended on computational tools. Argibay and Chandross’s theory arose from simulations that calculated how individual atoms were affecting the large-scale properties of a material, a connection that’s rarely obvious from observations alone. Researchers in many scientific fields use computational tools to take much of the guesswork out of research and development. “We’re getting down to fundamental atomic mechanisms and microstructure and tying all these things together to understand why you get good performance or why you get bad performance, and then engineering an alloy that gives you good performance,” Chandross said. Still, there will always be surprises in science. In a separate paper published in Carbon, the Sandia team describes the results of a remarkable accident. One day, while measuring wear on their platinum-gold, an unexpected black film started forming on top. They recognized it: diamond-like carbon, one of the world’s best man-made coatings, slick as graphite and hard as diamond. Their creation was making its own lubricant, and a good one at that. Diamond-like carbon usually requires special conditions to manufacture, and yet the alloy synthesized it spontaneously. The phenomenon could be harnessed to further enhance the already impressive performance of the metal, and it could also potentially lead to a simpler, more cost-effective way to mass-produce premium lubricant. Sandia National Laboratories (www.sandia.gov) is a multi-mission laboratory operated by National Technology and Engineering Solutions of Sandia LLC, a wholly owned subsidiary of Honeywell International Inc., for the U.S. Department of Energy’s National Nuclear Security Administration. Sandia Labs has major research and development responsibilities in nuclear deterrence, global security, defense, energy technologies, and economic competitiveness, with main facilities in Albuquerque, New Mexico, and Livermore, California.